Ever overdraw on your checking account or max out a credit card? It’s not hard to do if you’re not keeping track of things. How can we manage household expenses without some sort of record keeping? Away from home, in the business sector, record keeping becomes even more important. In fact, it’s the very thing covered by HACCP Design Principle No. 7. Principle 7: Establish record keeping procedures. – This HACCP principle requires that all food manufacturing plants maintain records to show they implemented a HACCP plan, are following all principles, and the plan is working effectively. Let’s look at an example. In keeping with the directive of HACCP Design Principle 7, the engineering department of a food manufacturing plant must keep records for each design project. The design record for a new cookie forming machine would contain things like engineering calculations to determine strength requirements of machine parts and supports, as well as power requirements for the electric motor that drives the machine. This design record would also contain documentation concerning materials selected to construct the machine, as well as dimensioned mechanical drawings of the machine and its parts. These dimensioned drawings will show all physical dimensions of the machine and its constituent parts. The record would also contain test results and analysis of the results. Lastly, the design record must include a risk analysis of potential hazards that could result. Other activities include identification of CCPs, establishment of critical limits, and other factors in accordance with HACCP Design Principles 1 through 5. In other words, the record must be complete, bearing witness to an effective adherence to HACCP Design Principles 1 through 5. Principle 7 also encompasses guidelines set in place through Design Principle 6, which calls for the establishment of procedures to govern Principles 1 through 5. A complete record would contain the procedures themselves, along with any revisions. It would also contain documentation that the procedures were reviewed and approved by management along the way. Finally, of what use would records be if they were incomplete, disorganized, and outdated? A document control system not only establishes procedures, but assigns responsibilities to personnel within the department for filing design records to make sure that everything is up to snuff. This system would encompass everything, from the creation of engineering documents, to their timely entry into the record keeping system. We have now exhausted our discussion on HACCP Design Principles. We’ll switch to a new topic next time, examining some basic concepts behind the control of industrial equipment and machinery. 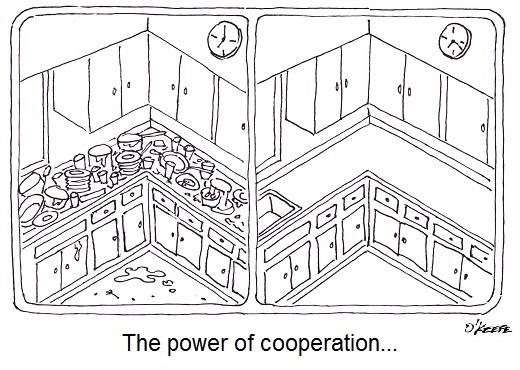 You can imagine what would happen if a food manufacturing plant operated like a disorganized household kitchen. Although employees may know they are responsible for delivering safe products to consumers, without the right procedures in place an unsafe chaotic mess may result. To get everyone moving in the right direction we look to guidelines established in HACCP Design Principle No. 6. Principle 6: Establish procedures for ensuring the HACCP system is working as intended. – In large part this Principle acts as a report card. It follows up on the guidelines established in Principles l through 5, organizing activities into written procedures. For example, design engineers must routinely analyze important identified stages within a design project, then write procedures, that is, a step-by-step instruction guide, which encompasses them. In this way personnel involved in the design process make best use of the safeguards put in place by HACCP Design Principles 1 through 5. These steps include things like preparing design proposals, analyzing risks and hazards, creating preliminary designs, conducting design reviews, building prototype equipment and tooling, running tests, collecting test data, and analyzing test results. For each step, responsibilities of key individuals involved must be clearly defined and sequentially ordered. But writing department procedures is only part of Principle 6. Procedures are no good if they’re just thrown into a file cabinet and no one ever looks at them. What good are guidelines without a full understanding of how to use them? Training may be necessary, and management must decide what form that educational process takes to be most effective. Engineering management must verify that established procedures are adequate to the task. This typically involves taking a hard look at finished design projects and checking critical factors. Was an adequate risk analysis performed? Were sufficient critical control points established and critical limits monitored for effectiveness? 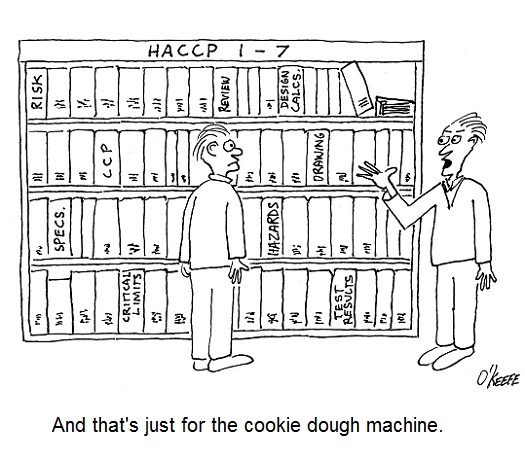 Next time we’ll wrap up our discussion on HACCP Design Principles by examining No. 7. It’s the last of the Principles and it’s concerned with establishing record keeping procedures.